In this installment I'll show you how to use Grill Mates® Garlic & Onion Medley Seasoning to take grilled zucchini to an interesting and delicious new level. The bold garlic and onion pair perfectly with zucchini in a balsamic vinaigrette to create a great grill-friendly side dish. Note: If you can't find baby zucchini use normal sized ones that are quartered lengthwise. Wash the zucchini under cold water and drain well. Trim about 1/8" from the stem of each squash. Square each zucchini by removing a sliver from each side. Combine the seasoning, oil, vinegar and pepper in a large zip-top bag. Seal the bag and shake to combine the marinade ingredients. Add the zucchini to the bag, seal, and set aside for one to two hours. Prepare your grill for direct cooking at medium heat (about 350º). Oil the cooking grate lightly with canola oil. 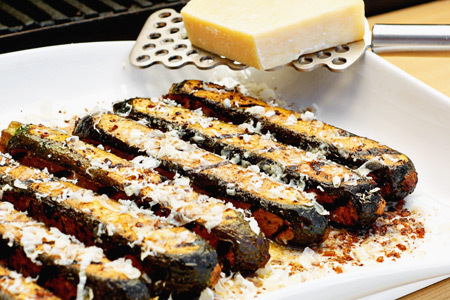 Remove each zucchini from the bag, shake off the excess marinade, and lay them on the grill at a 45º angle. Reserve the marinade left in the bag. Grill each side until they are nicely browned, about 2-3 minutes. Lightly brush the zucchini with a small amount of the marinade each time you turn them. Remove the zucchini to a platter in a single layer and immediately shave the cheese over them to taste. Those look delicious, good job! I will have to try these. Okay - I'm trying this on Saturday night at our BBQ - will let you know how it goes! !